Ebauche du feminin I. 50 signed & numbered impressions on hand-made chiffon du Moulin de Larroque paper, of which ours is n. 12. 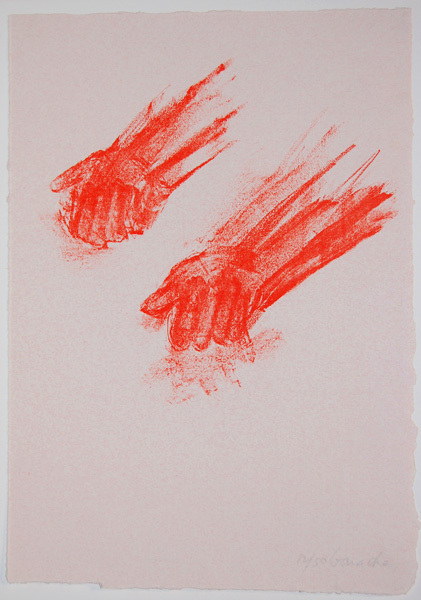 The lithographs were made to accompany poems by Alain Veinstein and published in the collection Médiane. (There is also an Englsih translation, without the lithographs, of The Archeology of the Mother, a series of poems about the female nudes of Claude Garache, by Tod Kanza and Rosemarie Waldtrop. Image size: 285x200mm. Price: $750. There were also 200 impressions on hand-made chiffon du Moulin de Larroque paper for the deluxe artist's book of the same title. The first lithograph was signed but not numbered; the remaining lithographs were neither signed not nmbered, but each of the books was signed by both Garache and Veinstein and numbered. Ebauche du feminin III. 50 signed & numbered impressions on hand-made chiffon du Moulin de Larroque paper, of which ours is n. 12. 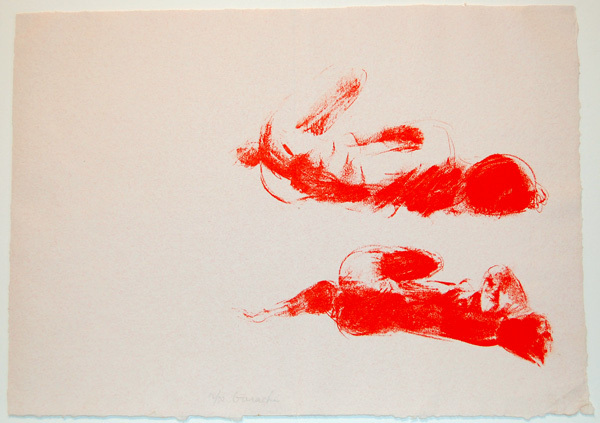 The lithographs were made to accompany poems by Alain Veinstein and published in the collection Médiane. (There is also an Englsih translation, without the lithographs, of The Archeology of the Mother, a series of poems about the female nudes of Claude Garache, by Tod Kanza and Rosemarie Waldtrop. Image size: 285x200mm. Price: $750. Ebauche du feminin IV. 50 signed & numbered impressions on hand-made chiffon du Moulin de Larroque paper, of which ours is n. 12. 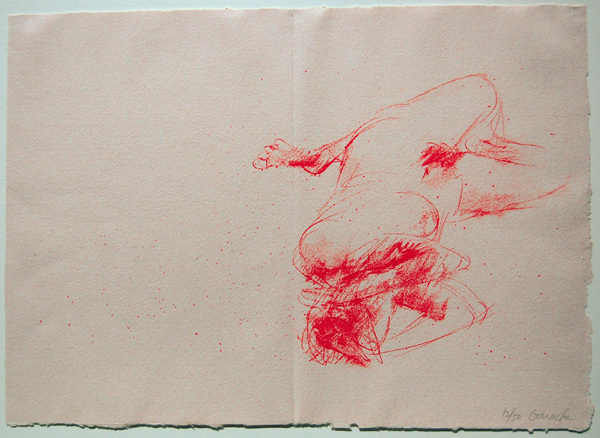 The lithographs were made to accompany poems by Alain Veinstein and published in the collection Médiane. With the centerfold. (There is also an Englsih translation, without the lithographs, of The Archeology of the Mother, a series of poems about the female nudes of Claude Garache, by Tod Kanza and Rosemarie Waldtrop. Image size: 285x400mm. Price: $750. Ebauche du feminin IV. 50 signed & numbered impressions on hand-made chiffon du Moulin de Larroque paper, of which ours is n. 12. 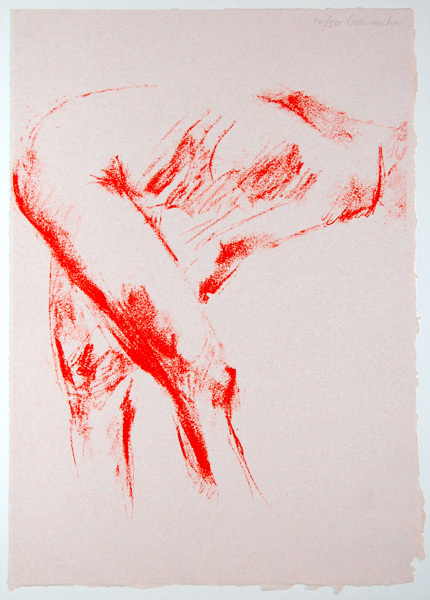 The lithographs were made to accompany poems by Alain Veinstein and published in the collection Médiane. With the centerfold. (There is also an Englsih translation, without the lithographs, of The Archeology of the Mother, a series of poems about the female nudes of Claude Garache, by Tod Kanza and Rosemarie Waldtrop. Image size: 285x200mm. Price: $750. Ebauche du feminin VI. 50 signed & numbered impressions on hand-made chiffon du Moulin de Larroque paper, of which ours is n. 12. 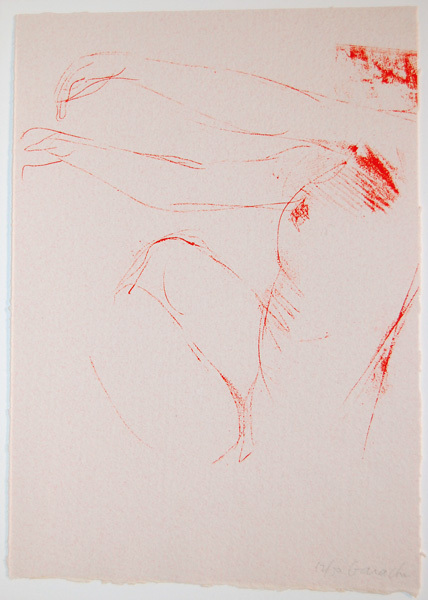 The lithographs were made to accompany poems by Alain Veinstein and published in the collection Médiane. (There is also an Englsih translation, without the lithographs, of The Archeology of the Mother, a series of poems about the female nudes of Claude Garache, by Tod Kanza and Rosemarie Waldtrop. Image size: 285x200mm. Price: $750. Ebauche du feminin VII. 50 signed & numbered impressions on hand-made chiffon du Moulin de Larroque paper, of which ours is n. 12. 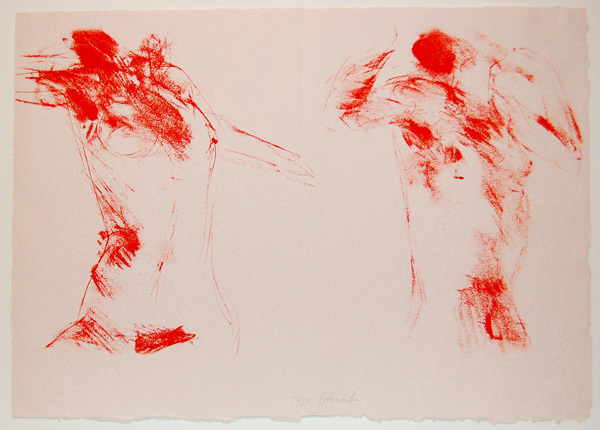 The lithographs were made to accompany poems by Alain Veinstein and published in the collection Médiane. With the centerfold. (There is also an Englsih translation, without the lithographs, of The Archeology of the Mother, a series of poems about the female nudes of Claude Garache, by Tod Kanza and Rosemarie Waldtrop. Image size: 285x400mm. Price: $750.